Edited by artu at 01:45, 02 Oct 2018. If you are a political analyist and you define capitalism as a system of altruism, it is beyond any reasonable doubt that you are not an intellectual terminator, and since your arguments are flawed by default, I�d say it is quite fair to say they are incapable of terminating anything. About the X destroys Y format, they are usually uploaded on Youtube by some alt-right �cheer leader� who cherry-picks some 3 minute piece from a debate, if the guy in the video is reasonable enough to attract my attention, I track down the whole debate and almost evertime, it is rather both sides cornering each other mutually in various moments, and in a manner much more calm and responsive than the uneducated cheer leader�s masturbative cherry-picked version. Btw, if you happen to think Shapiro is always on so spot, you may also find it interesting to know that he defines the alt-right, the motherlode source of such �X destroys Y� videos as �"a garbage movement composed of garbage ideas. It has nothing to do with Constitutional Conservatism." You probably already know that he opposed Trump and supported Cruz in the elections. Oh, and Trump is an estate guy not finance exactly, he screwed big time many times using the money inherited from his family, got back on his feet simply by screwing his investors and blatantly lying about the outcome of his projects. And I�d say in any field requiring brain work, be it finance, science, art, medicine, math... people who are on top of the top are above average IQ in general, finance isnt extremly special. Edit: While returning to your links, I just noticed you also mention a Democrat "myth of abortion" and since it's in the context of defending Shapiro, I have to conclude that "the mythical" part would be not to equate abortion to murder. I'm guessing you have friends who had abortion and you dont treat them like murderers, and not because of some "liberal myth" but basic common sense. So, unless it is just to "support your team" blindly, can you please tell me what is so mythical about stating the fact that removing a fetus that has no developed nerve system, put aside a consciousness, is not the same thing as killing someone? Edited by Salamandre at 11:51, 02 Oct 2018. I say "terminator" is a label which suits him on youtube level, I don't think Shapiro has the capacities to stay beyond the "x destroys y" boundaries, he is a polemist, period. Also, what I say is that he fulfills his role, which is stand and debunks the load of crap we hear from you folks, this is how election should be prepared in any democratic country, have both sides tell their truth then let people have their fair say. Trump is there because of Tucker, Shapiro, Anne Coulter, Gavin etc, they had better arguments and they won the debate. Such people are literally prohibited from medias in Europe and that's a pity. I don't think Shapiro is always on spot, as usual you try to paint me as embracing all his views because I just agree with some of his points, dully noted above: systemic racism (myths was about it, sorry), immigration and abortion. I don't challenge the scientific statu quo of abortion, which is cloudy from any point you look at - before abortion, we can safely state there are 100% chances that a new life will occur, then life is so rare in the Universe, maybe its our unique chance - but the spiritual, religious and responsibility aspect. Abortion became a juicy market where it should be the exception, a hard to bear and sad decision, with serious consequences. You don't get impregnated by the holly spirit, you choose to, its ludicrous to consider it as an accident and get rid of the fetus as easy as removing puss. Finance is the toughest area and no one is safe, thats why is so harsh and a men's area uniquely, until now at least. Trump started with an inherited of 40 millions then today he is worth 16 billions. He created jobs for hundred of thousands of people, he also created an empire and he succeeded in everything he planned, including becoming Potus. He is not on my top list of people to criticize, I would say, my brain always functions in a context. Finance is about multiplying your capital, and anyone living in the real world, struggling to survive and get better knows this is a process which requires very high IQ and creativity in order to work. Also, thousands of people depend on you, can you cope with that stress? Building such empires, only a few have that capacity, your understanding of this particular aspect is very superficial. lol, talking about shallow stereotypes. Someone obviously voting republican uploads a debate then gives a click bait title to make views thus money, and that makes him alt-right, no wonder you guys see alt-right everywhere, witch hunt. Finance is actually largely about making money without producing anything, many of its economic incarnations are parasitic. A smart parasite is a parasite nonetheless. Edited by artu at 19:27, 02 Oct 2018. And I say �intellectual terminator� is a propositional phrase you can not dissect like that. This is not James Joyce level literature, is it? The metaphor indicates that Shapiro�s level of intellectuality is on such a level that he terminates arguments by the power of that intellectuality. Unlike you, the guy who edited that video really thinks his arguments are super intellectual arguments, not �intelligent enough to debunk crap� arguments. (They are not even that.) Btw, let�s take a wild guess here, if you are so modest about his capacities, don�t you think why you always find his arguments �fulfilling� on such issues is actually because he thinks quite similar to you on them? Your second suggestion, that democracy is an arena of convincing arguments is dangerously incomplete. Democracy is the optimal system we can come up with as of now. Any other system, no matter the ideology or benevolence behind it, is much more vulnerable to corruption by exploitation of power. The pluralism of democracy is an insurance against totalitarianism, however, that only functions when you don�t mistake majoritarianism for pluralism. That�s why people came up with principles such as separation of powers and free speech. (So, of course it is a pity if such people are literally prohibited in Europe but whenever you claim things like that, I check and they have books and blogs and so on...) But Trump did not win because he had the better argument, he won because he saw a massive reaction to status quo and he is crafty enough to jump on that. Masses respond to emotion, not �convincing arguments.� Trump figured out how to manage that. I don't think Shapiro is always on spot, as usual you try to paint me as embracing all his views because I just agree with some of his points, dully noted above: systemic racism (myths was about it, sorry), immigration and abortion. I don't challenge the scientific statu quo of abortion, which is cloudy from any point you look at - before abortion, we can safely state there are 100% chances that a new life will occur, then life is so rare in the Universe, maybe its our unique chance - but the spiritual, religious and responsibility aspect. Abortion became a juicy market where it should be the exception, a hard to bear and sad decision, with serious consequences. You don't get impregnated by the holly spirit, you choose to, its ludicrous to consider it as an accident and get rid of the fetus as easy as removing puss. They don�t always choose to get impregnated and nobody would prefer an abortion to a morning-after pill, don�t be silly. Life is full of unexpected things, a condom may not function, the couple can be drunk after a wild party, they may break-up and resent each other while she is pregnant� Do you seriously believe women think like �well, whatever, I�ll just pay some doctor a 100 dollars to scrape off my uterus afterwards.� And there is no religious or spiritual aspect. People whose religion dictates that a soul is beamed up in the womb, the second the sperm touches the uterus are already free not to have abortions. If they want to stick by their tale, they can, rest of us don�t have to. You started using the term witch hunt quite lightly these days, Sal, are you becoming a SJW? It�s a generalization, of course, but not an inaccurate one. The significant exception would be religion debates where you run into a lot of videos titled �Sam Harris/Hitchens/Dawkins etc. destroys fundamentalist Muslim/Christian.� But in such cases it is impossible not to destroy arguments with the caliber of "the world is 6000 years old" anyway. Other than that, �X destroys Y� videos usually come from alt-righters and they attack political correctness. (That's what signifies the alt-right.) Yet, they end up in some ironic position where they seem to claim anything politically incorrect is the truth. It�s another form of puritanism, only in reverse mood. Jesus Bleeping Christ, this thread too. 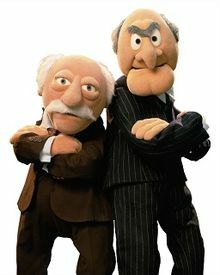 Yeah, well, you young Muppets will have to get used to us old Muppets. We were raised in times when Twitter's 140 characters per post wasn't the norm. I almost never link or even listen to videos titled as "x destroys y", those are click baits to generate money and usually present incomplete or edited debates. But why people listen to such? Because they have enough of the usual propaganda, is like oxygen after being for a long time in a septic tank, call it emotional if you want, it is perfectly understandable to me. Speaking of Christ, I love what the disciples were told about people who won't listen : And if anyone will not receive you or listen to your words, shake off the dust from your feet when you leave that house or town. Comment: Are we the world? Why am I here? What exactly is this? Am I still high? Edited by artu at 19:57, 16 Nov 2018. Comment: Legend has it that there is still a hole in the ozone above the studio where this took place. "This is the musket he uses to protect his virginity." What does a musket really sound like? Edited by fred79 at 00:11, 13 Jan 2019. "Slipknot really changed over the years." i busted out laughing, and hard enough to hurt my throat. "Beat so hard my pubic hair got already 3 dreads"